If you don’t know already, we’re hooked on essential oils. Especially our own – in.essence line of essential oils – which are some of the best quality organic, dietary essential oils you’ll ever find on the market. And there are so many ways that you can use them. So many in fact that we wanted to share with you with some of the most unusual uses people have shared with us! Prepare for some weird, but very useful ways that you can use our in.essence organic essential oils! Enjoy a break from the city life whenever you camp or spend time in the great outdoors by bringing some essential lemongrass oil with you. We recently brought it to the Caribbean to ward off the late night nibblers. Bonus Tip: It even helps to get rid of fruit fly infestations back at home (especially in the kitchen). No need to chop off your beautiful locks or reach for that jar of mayo! A few drops of essential lemon or orange oil will help to loosen up sticky substances like gum for easy removal. Bonus Tip: They also help to remove gum from carpet, sticky labels from almost any surface, tree sap from gardening tools, and even a hard to clean whiteboard. Be ready for cooler weather by keeping your leather boots fresh and soft with a little bit of essential lemon oil. It naturally moisturizes the leather, which helps prevent it from cracking. As if getting gum out of your hair and keeping your leather goods soft and supple wasn’t enough, essential lemon oil can give a turbo boost to your highlighting hair products as well. When paired with your product of choice, it will naturally increase the sun’s bleaching effects on your hair, giving you even more bang for your buck! No one likes to get stung by an insect. Use essential lavender oil to wipe away the sting and relieve any sudden urge to scratch that itch! Bonus Tip: Keep this oil handy in the kitchen to soothe not only bites but burns as well. Now that you’ve seen the many strange, yet useful ways you can use essential oils, we want to take a moment and talk to you about why we created in.essence, our organic, dietary essential oil line, and how it is different from other essential oils. While it is so easy to just buy the first essential oil you see at the store, buying without any awareness or knowledge of what goes into these products may be putting your health at risk – exactly the opposite of why you are buying these amazing oils. When we first discovered the benefits of essential oils (many years ago now), we too wanted to get our hands on them as quickly as we could. But to our surprise, none of the oils we could find were safe enough to use in the way we wanted to use them. For example, we wanted them to flavor our nutreince multivitamin drinks, to use in our favorite recipes and to apply to our skin. Most of the oils we found were not organic and because of this contained very high concentrations of fruit rind and plant extracts that may have been exposed to toxic herbicides and pesticides. There was no way we were going to put these potentially contaminated oils into our food, on our bodies or even diffuse them into our home. To add insult to injury, a lot of these brands were expensive, really expensive. A one-two punch against our health and our wallet! Then we found out something else. Out of the many different companies we looked into that were selling essential oils, most of the really big ones operated by having multiple-levels of incentive salespeople buy their products from them at one price, and then turn around and sell them to their friends and family for a higher price. Now, we are all for being an entrepreneur, but because these companies have to make sure there is enough profit to go around for everyone, at multiple levels, prices have to be greatly inflated. This leaves the end customer paying highly inflated prices for their essential oils. So that’s when we sat down and decided and created our own line of safe and affordable essential oils that we could use ourselves and that our customers could trust. 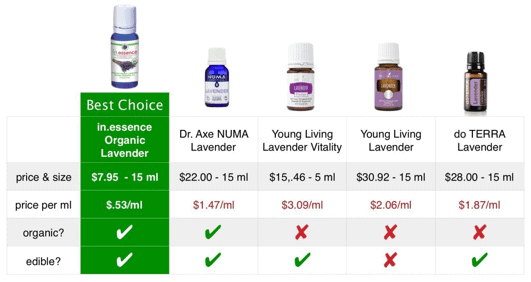 Our in.essence essential oils stand apart from the crowd for their safety, higher quality, and affordability. All five of our essential oils (Lemon, Orange, Lavender, Lemongrass and Basil) are 100% USDA certified organic, and extracted using steam distillation or cold pressing. The entire line is both therapeutic and food grade quality, so they’re safe to use both outside and inside your body. See the difference? We truly believe that in.essence is a titan in the essential oil industry. For the price, size, and quality, you’ll be hard pressed to find anything like it. Now, if you want to learn even more ways to use our in.essence line of essential oils, don’t worry, we’ve got you covered. Download our FREE essential oil quick start guide down below, where you’ll get a $5 off coupon for in.essence and some amazing and yummy recipes to make once you’re ready to see for yourself just how incredible essential oils can be.